There are surprisingly few places to go trail riding within 30 or so miles of Omaha. One option is at Mahoney State Park out in Ashland, Neb., which is about midway between Omaha and Lincoln. I’ve gone horseback riding at Mahoney as a kid and recently, I decided that it was time to hop back on the saddle, and this time, bring my son along for his first horse ride. My daughter wasn’t old enough for a trail ride, so she’d have to settle for a pony ride. Mahoney State Park is family-favorite place to explore in any season, including exciting updates in 2018. The first time we went just for horses, though, didn’t quite work out for us. All trail ride slots were filled. So, I learned a few things to share with you. 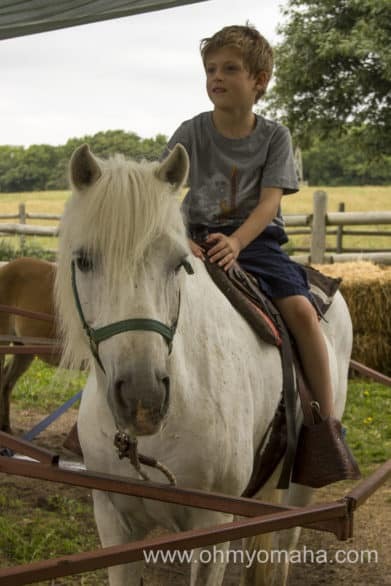 Before you trot out to Mahoney to take the kiddos on a trail ride, there are a few things you should know how it works, from getting your tickets to timing your ride. 1. You can only buy tickets in person at the administration office starting at 8 a.m. Call ahead of time to see if there are spots left, (402) 944-2523. 2. 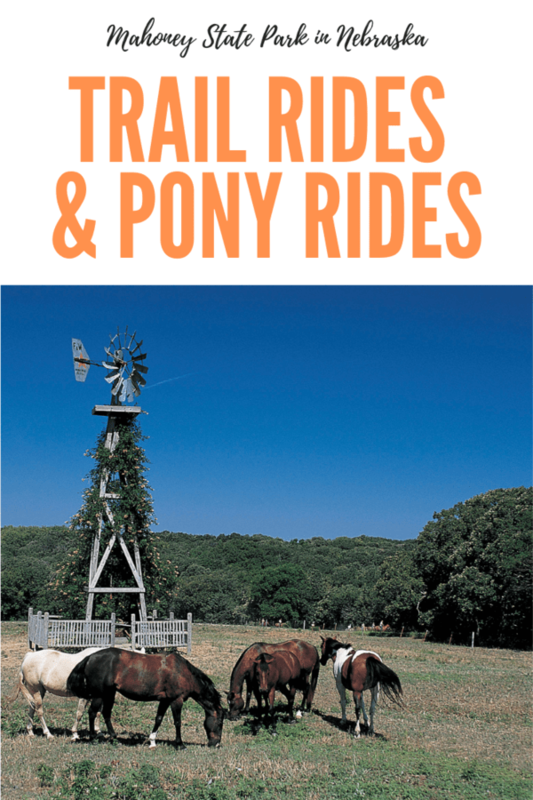 Trail rides are for ages 6 and older. 3. Trail rides last about 45 minutes to an hour. Hours in 2019 may change a bit, but to give you an idea of what to expect, here are the hours set for 2018: Monday through Friday (9 a.m., 10 a.m., 11 a.m., 1:30 p.m., 2:30 p.m. & 4 p.m.); Saturday and Sunday (9 a.m., 10 a.m., 11 a.m., 1:30 p.m., 2:30 p.m., 4 p.m. & 5 p.m.). 4. Trail rides are $18. * This price may increase in 2019. 5. 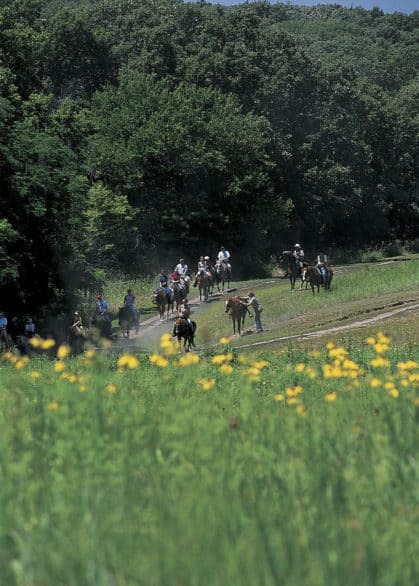 Horse trail rides run from May to October. 6. Holiday weekends are the busiest times at Mahoney State Park. Which drives home point No. 1. Call ahead. Farley on a not-so-little pony ride. 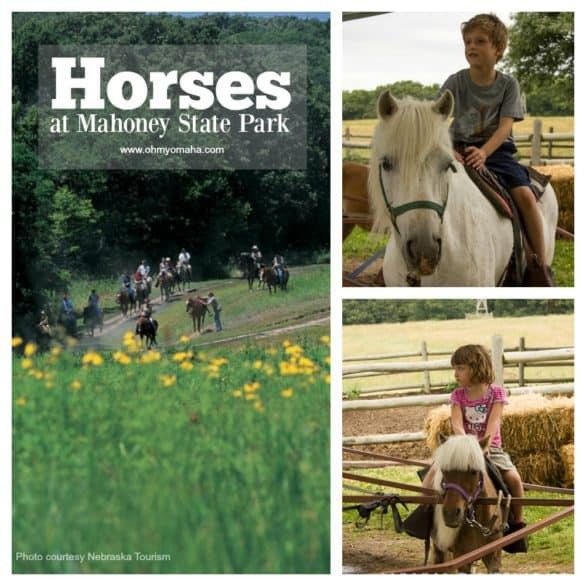 Pony rides at Mahoney State Park are $6 and are offered seasonally. 1. Kids ages 3-9 can ride the ponies. 2. Pony rides run from May to October. Rides are from 10 a.m. to 5 p.m. daily, with reduced hours starting mid-August. From mid-August to Labor Day weekend, pony rides are only on Saturdays and Sundays and Labor Day. Pony rides are weather permitting. 3. Pony rides are $6 and you can pay at the stables or at the Administration Office. I think $6 is a little steep for a five-minute pony ride in a circle. I made the rookie parent mistake of promising them a pony ride before knowing the price…and you know there’s no backing out of that kind of promise. I was so disappointed last time we went just because I had my heart set on riding. They said it was too hot for the horses. I know they need to look out for them. I just wanted to finally ride as a whole family. My kids, now in their teens, and actually much prefer the riding stables at plate river state park as it is more scenic and there is the shooting range that my son can use while my daughter rides. We really liked Platte River’s trail ride, too! They actually let kids slightly younger ride.